You deserve a one-of-a-kind ring, no matter your budget!! There's a store for everyone, whether you're going for traditional, totally different, cheap AF, or willing to *splurge*. 1. 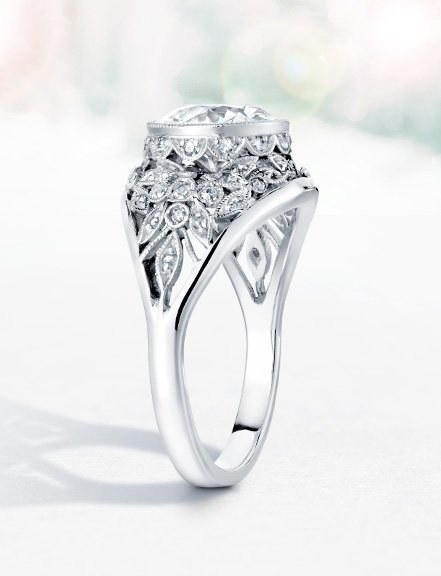 Blue Nile, a traditional and well-established seller, creates custom rings that are accessible for every price range. Plus, they tell you everything you need to know (i.e. carats, setting styles, etc.) so you don't need to do extra research. Why it's great: If creating your own design seems like a daunting task, this site will break it down for you. Start with the diamond (shape, price, and carat), choose your setting (or band), and then finish off with your sizing. Each step has tons of information, charts, and videos to make every option as detailed as possible. It even lets you shop by budget to narrow down the search! If you need even more info, there are tons of available articles and charts to answer your questions. How long it takes: It depends on your custom order. Shop similar diamond rings here. 2. Anemone Jewelry, an inexpensive Israeli designer (almost all options are under $100), offers tons of non-diamond options if you're looking to go the untraditional route. Why it's great: Moonstones, topaz, rose quartz, fresh water pearls, and more replace typical diamonds for a more singular approach. The designer will work for you based on an existing design or you can start from scratch, depending on your preference. Plus, most designs take two to three days to create (based on ready-made options). How long it takes: 8-14 days on average, but could vary depending on your custom order. Get the ring pictured above here. 3. 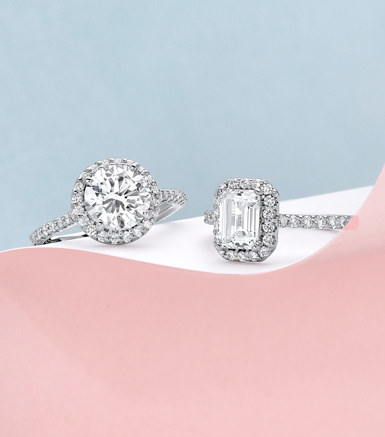 NY Fine Jewelry, a New York-based shop, updates traditional engagement rings for a fresh take (without veering too alternative). Why it's great: This is best for those who want something different, but like the look of a sparkling ring. You can opt for a band with a cluster of diamonds, or a elaborately embellished setting with either a diamond or other brilliant stones (or even pearls). The prices are reasonable so you can get your glitz without breaking the bank (many options are under $1,000) — *or* if you're looking to splurge, there are plenty of drool-worthy selections. The designer is happy to work with you on your very own concept or change what is already available on the site. How long it takes: Two to three weeks on average. Get the diamond ring here and the diamond band here. 4. 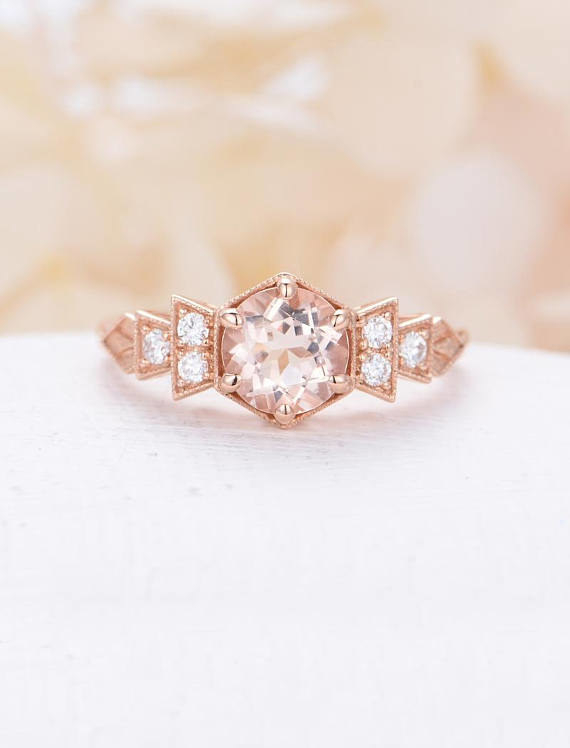 Jennie Kwon Designs, a modern designer, has a penchant for glimmering, on-trend creations, and works directly with customers to create their dream ring. Why it's great: If you're looking for a luxurious, one-on-one experience (but on a budget) then this is for you. Work with their team to adjust ready-made rings to your liking, or start from scratch. They'll even work with stones that you provide like heirloom diamonds or other gems. Plus, they only source stones from ethical sources and suppliers. How long it takes: 10 days on average, but depends on your custom order. 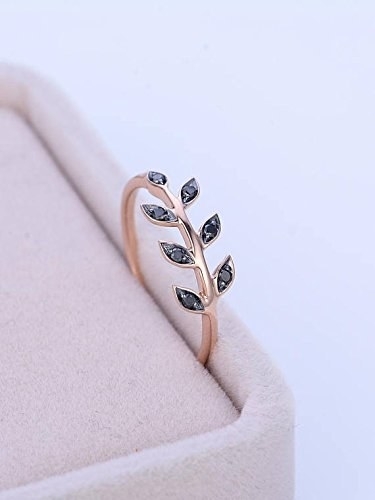 Shop similar bands and gemstone rings. 5. Myray Gem, an affordable shop for blingy yet reasonably priced pieces, lets your bank account *shine on* even when you say "I do." Why it's great: You don't need to compromise between getting a rock on your finger or staying within your budget here. Browse through their ready-made designs for a range that includes delicate bands and sparkling stones. You can contact the seller to modify pieces you see on their shop, or create your own design entirely. Most are under $1,000 and many are even under $500! How long it takes to create: 11-15 days on average. Get the gem ring here and the band here. 6. 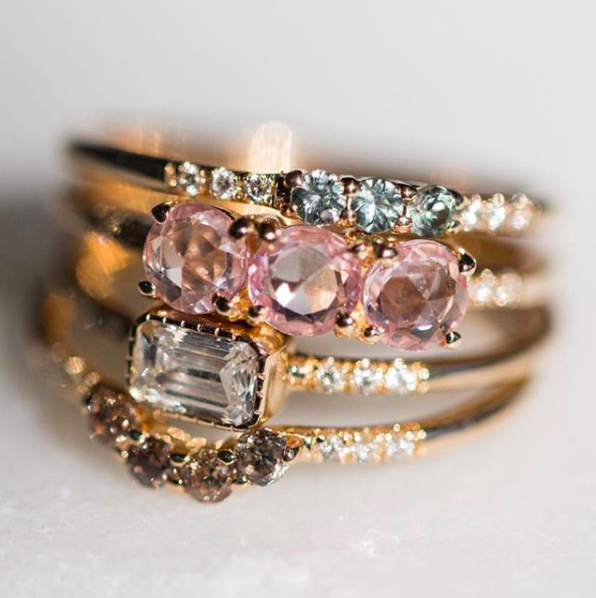 Forever Artisans, a group of designers from Wisconsin, are committed to creating your idea of a perfect engagement ring from scratch. Why it's great: It's up to you which process you'd like to follow when creating a design — you begin with two choices. You can pick "tell us a little" for an artisan to take you step by step right from the beginning, or "tell us a lot," which will have you take an interactive quiz to tell them about style preferences and a budget. There are also three ways to design your custom ring: create it from scratch, modify an existing design from their shop, or replicate something you've seen and liked (i.e. on a celeb). You'll first provide a sketch or image, and then they'll create the ring through a computer design. After you approve of the visual model, they'll hand craft the ring! How long it takes: About three weeks on average. 7. 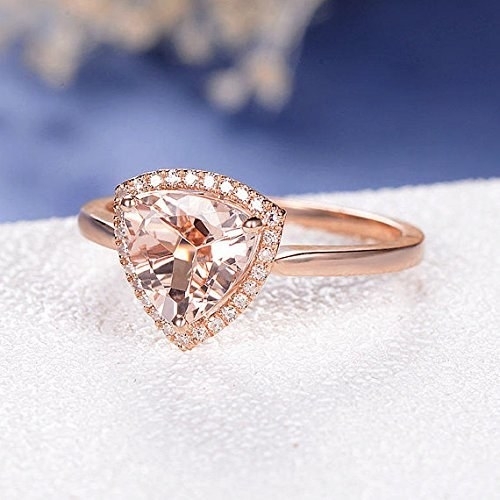 Love Rings Design, a shop for alternative engagement rings, puts a sparkle in everyone's eye without resorting to your everyday diamond template. Why it's great: Pink sapphires, pearls, and aquamarines are just some of the eye-catching stones that make these gorgeous rings sparkle. 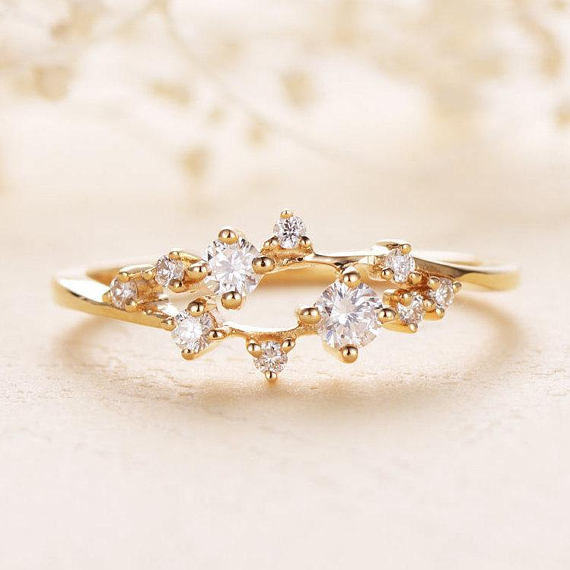 Of course, you can opt for diamonds, but don't worry about looking too traditional — their elegant cluster designs are far from usual. Start from the beginning when working with the designer, or build on a ring you like. Get the band here and the art deco ring here. 8. Jewell Ray, a designer of simple yet unique bands, focuses primarily with metal for anyone who wants to *put a ring on it* without being too flashy. Why it's great: Minimalistic and elegant, these bands will still make a big statement without breaking the bank. Opt for a metal design, or add a small stone for an extra pop. You can modify existing rings, or talk to the seller about creating your own from scratch. How long it takes to make: 4-5 days on average. 9. 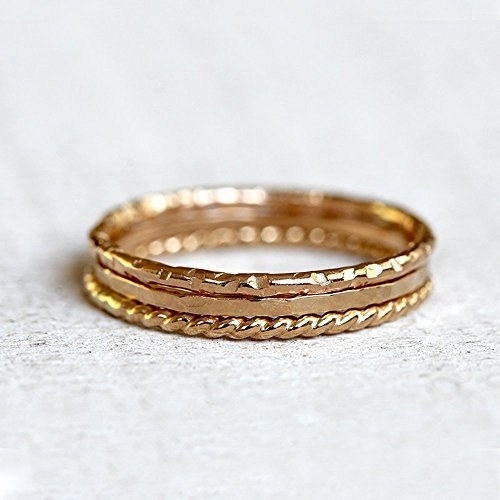 Love Jc Inc., an independent designer, uses ethical, conflict-free recourses to create sturdy, long-lasting rings that still look dainty and delicate. Why it's great: Based in New York City, this designer combines simple with bling to make rings look much more expensive than they really cost. 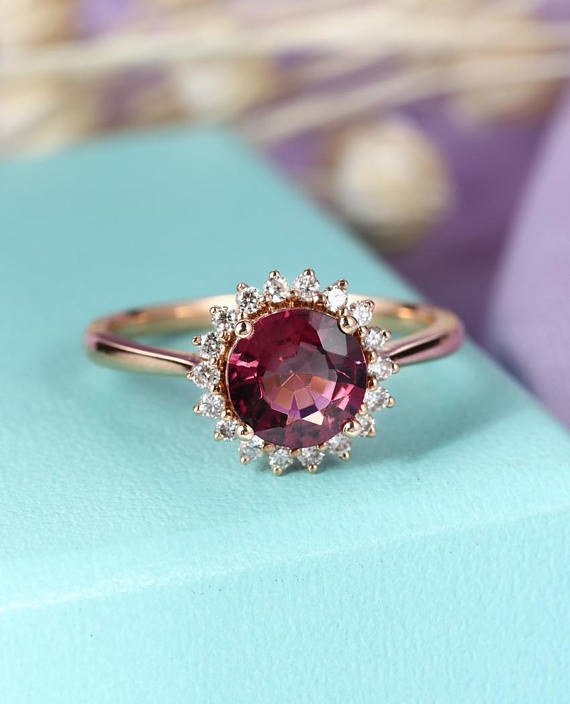 Even if you choose a ready-made selection, it'll be totally unique, thanks to options like rose gold diamonds, glittery bands, and uncommonly-shaped gems. Or, you can work on your own vision with the designer! How long it takes to make: 5-7 days on average. Get the band here and the diamond ring here. 10. 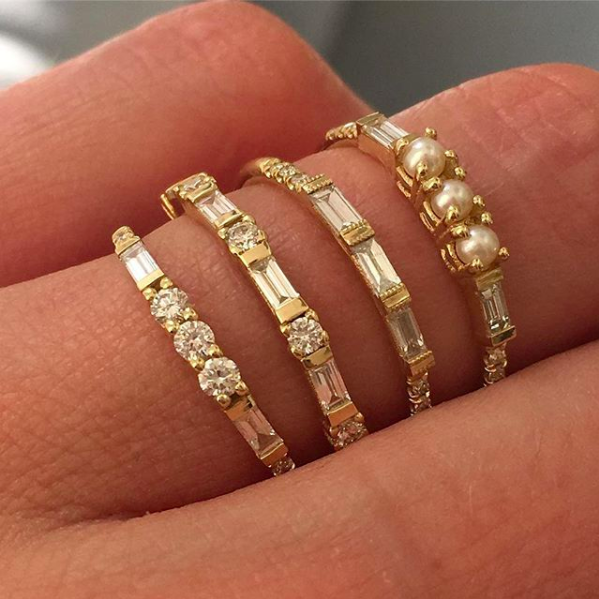 Catbird, a popular source for unique and fashionable jewelry, offers personalized touches to chic and gilded bands. Why it's great: If you'd like something one-of-a-kind, but also a cross between sophisticated and low-key, then this might be just what you're looking for. Their "written in the stars" band (above) combines two zodiac constellations (i.e. you and your partner's) for a hand-engraved creation that's both romantic and refined. Or, you can choose from other bands that offer personal engraving. How long it takes: one week-four weeks on average. 11. The North Way Studio, a Washington-based workshop, strays from run-of-the-mill diamonds and explores mesmerizing moonstones, sapphires, topaz, and more for sophisticated and vintage-y vibes. 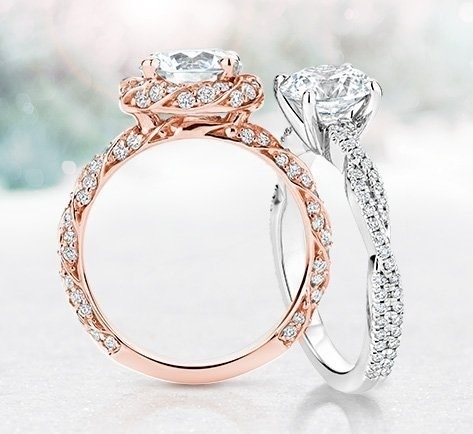 Why it's great: From fairy-tale-esque to art deco, each ring is a true work of art. Their stones are from typical (think pink, purple, blue, and more) and even the bands have tons of detail themselves. Thanks to their intricate workmanship, this studio creates jewelry that looks far more costly than it is. And, of course, you can contact the seller to collaborate on your own vision. How long it takes: 7-10 weeks on average. 12. Taylor and Hart, a site dedicated to personal service, consults with you on how to design your ideal ring from beginning to end so there's no room for doubt. Why it's great: Professional consultation can be expensive — so it's a good thing this site is here to advise you for free. You can contact them with your idea so an expert will respond with a quote and discuss what your next steps should be. After you choose your center stone (from a large selection of diamonds and gems), you'll have an opportunity to look at the final design before ordering. The whole process is personal but streamlined! 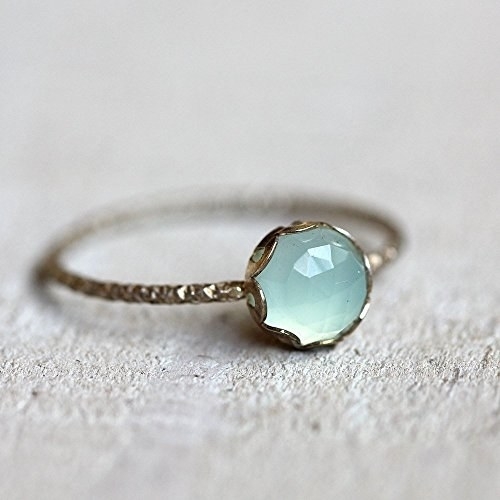 Start your inspiration from a gallery of custom rings (like the one above). 13. Lex Luxe, a fine-jewelry designer, specializes in hand-crafting custom orders so that you absolutely get your money's worth. Why it's great: This is the crème de la crème of higher-end Etsy jewelry. 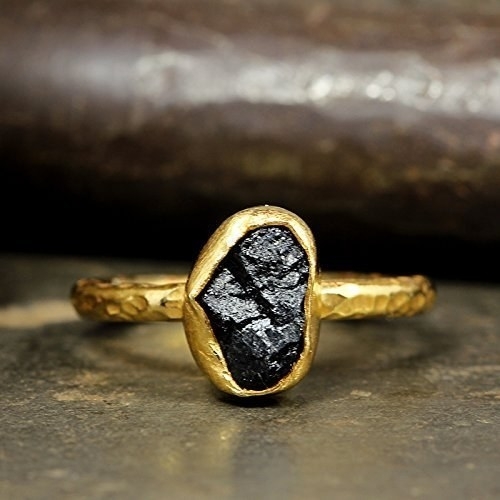 These selections boast ethically-sourced gemstones, diamonds (including black diamonds), and 14K gold that are all handcrafted to give you a personally-made ring. If you're in search of inimitable, high-quality fine jewelry, then this is a definite place to look. The designer will collaborate with you to come up with your very own ring, or make changes or additions to something you saw and loved. How long it'll take: Two to four weeks on average. 14. My Silver Story Shop, a delicate band oasis, puts just the right amount of bling on a minimalist's finger. Why it's great: If you like dainty with just a little bit of sparkle, consider this your spot. They may be little, but they carry a big punch — all are made from high-quality (and ethically-sourced) materials, like diamonds and and 14K gold. You can talk to the designer about a unique design just for you, or modify something already available. Plus, 99% of the selections are under $300. How long it takes: 10-14 days on average, but depends on custom orders. 15. Ritani, an online cross between modern and traditional, collaborates with you and your budget to make custom rings accessible for everyone. Why it's great: Making something as permanent and important as your engagement ring can be a seriously intimidating project — luckily this site makes it extremely simple for you. They'll ask you if you're new to ring shopping, or if you're familiar (aka I've been researching diamonds on Pinterest all my life, tyvm). If you're a newbie, you'll be matched with a ring advisor who'll help you along the way! Either way, a large selection of diamonds, bands, and most importantly, prices will be at your disposal to build your own ring. After, an expert will contact you with a 3D mockup for your approval (at no extra charge). They'll even arrange a free preview of the ring at a local jeweler. How long it takes: It depends on your custom design process and in-person preview appointment, but it could be as low as a week. Browse halo engagement rings and solitaire rings. 16. 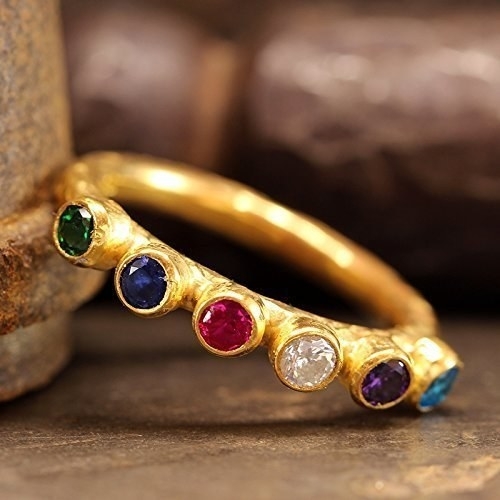 Caprixus, a Turkey-based family-owned store, flaunts a talent for combining hammered 24K gold with gemstones to give new meaning to putting a *rock* on your finger. 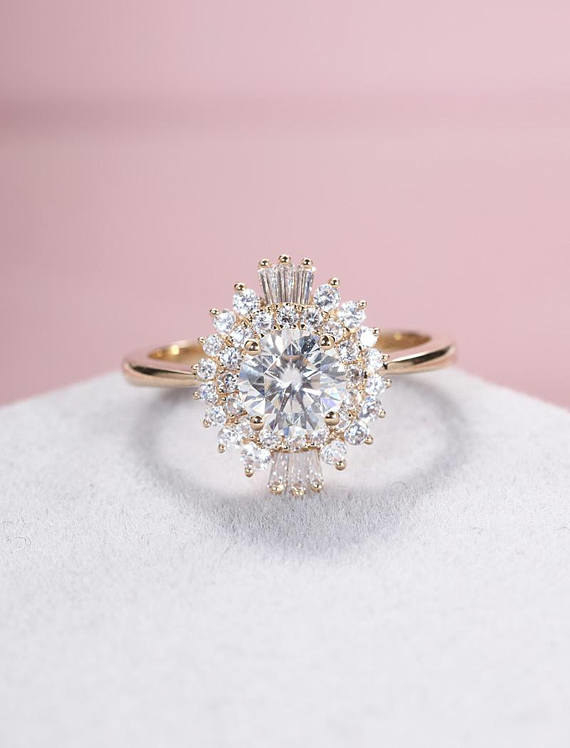 Why it's great: An ultra-affordable choice for those who want to veer from diamonds, this shop will handcraft your ring so even pre-designed options are really just for you. 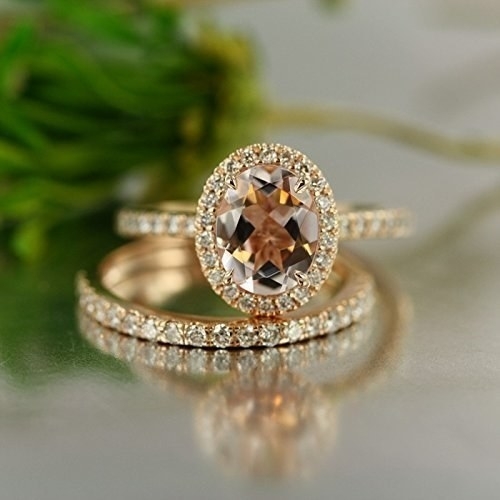 A combination of 24K gold and raw gemstones make this feel like a luxurious choice, even though most cost less than $50. Talk to the designers about what you have in mind if you'd like to go the custom route. How long it takes: 4-28 days on average. Get the black-stoned ring here and the multi-colored ring here. 17. Hello Ring, a sparkle-filled shop, boasts elaborately decorated rings available to everyone, thanks to their wide range of prices. Why it's great: Even if you don't want diamonds, these mesmerizing rings will dazzle with clear-cut, glittering stones of every kind. Each ring has an impressively intricate setting with embellished bands and gems with high clarity. 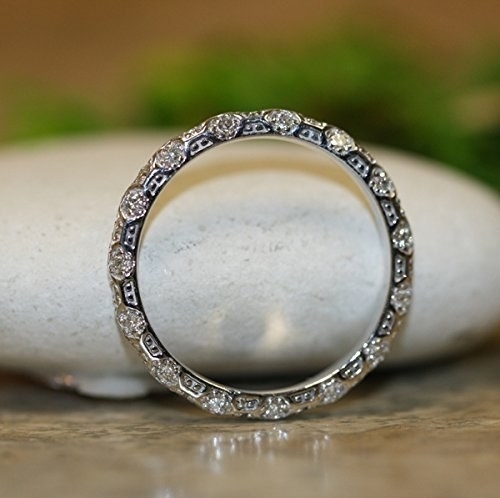 While not completely inexpensive, these rings fall under a reasonable budget and more than give you a bang for your buck. Get the diamond band here and the ruby ring here. 18. Anna Sheffield, a fine jewelry designer, partners with established experts to hand-make high-quality custom rings. Why it's great: Whether you'd like to create an adaption to a current design from their shop or conceive a ring from scratch, this team will consult you every step of the way in an extremely involved process. You can even have private sessions with the designer (Anna) for education on diamonds, stone sourcing, and design inspiration. For a higher price point, this will be your top-notch option for guidance and quality assurance. How long it takes: Four to six weeks on average. 19. Praxis Jewelry, a California-based designer, melds textured metal with gemstones for one-of-a-kind, singular rings that'll make even the most traditional shoppers second guess diamonds. Why it's great: For those who prefer simplistic, no-frill bands, these are a no-brainer. Even the rings that don't feature stones will stand out, thanks to their intricate etching and texture. Not to mention, there's a unique, hand-made ring for every budget. The designer can work with you to create your very own from scratch, or elaborate on something you already see! Get the gold bands here and the moonstone ring here. 20. Stag Head Designs, a wide-ranging shop, offers a little bit of everything, whether you're looking for a rare-looking band or a glistening gemstone. Why it's great: This shop has a vast selection of designs that hit just about every budget. They have titanium wedding bands, vintage-styled rings, and gemstones and diamonds of every shape and kind. They even have paired rings, so you and your partner can get matching styles. You can work with the designer to make your own, or refashion an already-available choice. How long it'll take: Six to eight weeks on average. 21. BBBGem, a team of designers, craftsman, and gem appraisers, concentrate on budget engagement and wedding rings so you can get your dream selection without spending too much. Why it's great: Particularly for those looking for a diamond alternative, these brilliant yet affordable designs are an appealing choice. 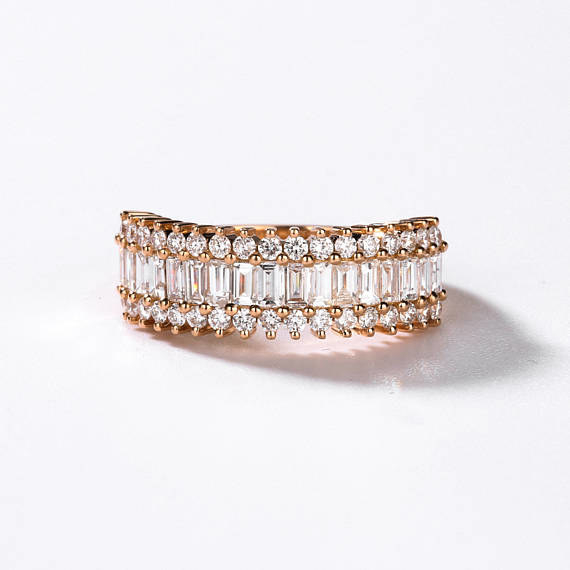 Pear cut white topaz stones, rose gold bands, and more seriously glitter without the demand for too much cash. Each are unique and handcrafted, so every budget gets the special treatment. Collaborate with the team to customize an existing option or create your very own design. 22. Brilliant Earth, a well-known conflict-free site, ensures designing your own engagement ring is simple and streamlined so you don't need to wait an eternity for your forever-jewelry. 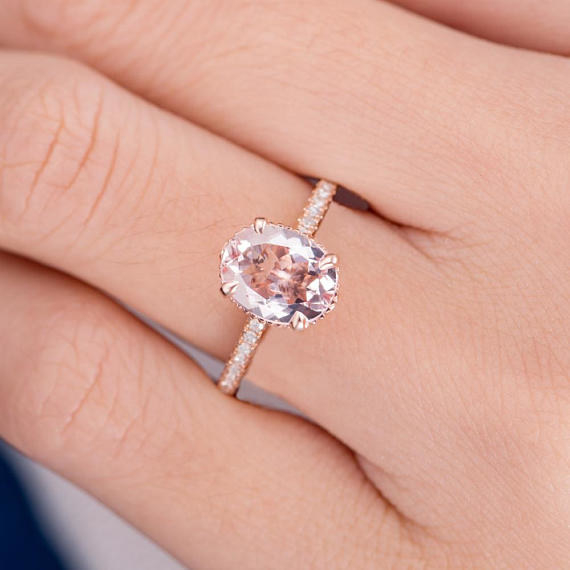 Why it's great: Consider this a fast-fashion approach to custom engagement rings. Whether you want to go with diamonds or gemstones, this site will make it as easy as 1-2-3 — because there are only three steps! First you'll choose your setting from a large, widely-ranged in price section. Next, you can pick your diamond or gem, and then finish off with sizing. Then all you have to do is accept compliments. Not to mention, they give 5% of profits to "education, environmental restoration, and economic development" of diamond-mining countries. How long it takes: two weeks on average. 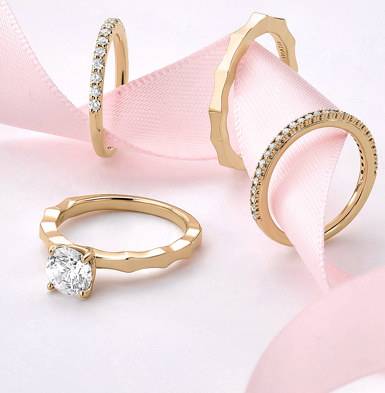 Browse rings like the ones pictured above here. 23. Seven Carat Shop, a fine jewelry specialist, guarantees each and every design is a true work of art, thanks to their attention to detail and creatively arranged stones. Why it's great: Even if you don't get a ring custom made, there is no way anyone else would have a ring like yours. Each selection is totally unique in their stone arrangement, shape, and in most cases even band design. They can lean on the pricier side (usually a little over or just under $1,000), but you can be sure you're getting your money's worth. Or, you can work with the designer to create something yourself. 24. Green Gem, an independent shop, hand-crafts uniquely made diamond and other stone rings that are surprisingly affordable. Why it's great: This designer brings you high-clarity diamonds, mesmerizing stones, and distinctive designs for far less than expected. If you're looking for something truly special, but want to keep the spending low, this is the ideal place for you. The designer will personally work with you to create a custom-made ring or modify one you like from their shop. How long it takes: Depends on custom order. *Builds a stage* *Shows off ring to whoever will look*.